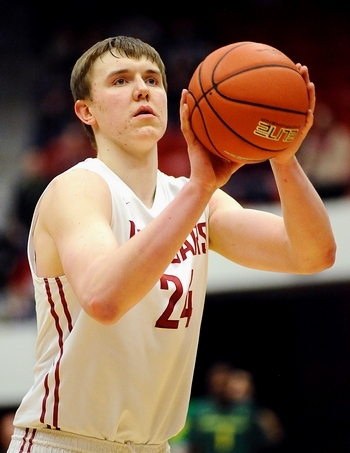 Jacob breaks down Josh Hawkinson, a 6-10 junior for the Washington State Cougars. Josh Hawkinson, the PAC-12’s reigning Most Improved Player, virtually came out of nowhere to average a double-double and lead the nation in defensive rebounds per game (8.7) for the Washington State Cougars last season. Unheralded as a high school recruit, Hawkinson’s Division I interest was limited to just three schools (Washington State was the lone PAC-12 school to offer him a scholarship). Washington State’s former coach Ken Bone saw a 220-pound lanky incoming freshman and planned for Hawkinson to pack on pounds in the mold of a former WSU star – Aron Baynes. But as Hawkinson’s frame filled out to 270 pounds as a freshman, his conditioning lagged behind and he failed to see consistent time on the court – playing in just 6.7 minutes per game for a bottom feeder in the conference. Last year, however, with the coaching change from Bone to Ernie Kent, Hawkinson’s opportunities were expanded in a starter’s role. Kent envisioned Hawkinson as more of a stretch four than as a one-dimensional bruiser and, as he slimmed down to 245, his speed and explosiveness improved. After averaging just 1.1 points and 1.4 rebounds per game as a freshman, Hawkinson averaged 14.7 points and 10.8 rebounds as a sophomore, registering 20 double-doubles on the season (fourth most in the nation). Hawkinson’s chances as an NBA prospect hinge on his continued emergence as a rebounder and defender, while capitalizing on his enticing potential as a floor spacer offensively. While Kent has tried to utilize Hawkinson’s smooth shooting mechanics to turn him into a dynamic floor spacer, Hawkinson has yet to find confidence with his shots from behind the foul line. He shot just 27-for-88 (30.6%) from 17 feet and beyond, including 6-for-30 (20%) on three point attempts. He has a quick release and shows glimpses of potential as a floor spacer when his confidence beams. Still, his footwork and hand positioning in the lead up to his shots is a little awkward. On the interior Hawkinson is one of the most polished players in college basketball. Hawkinson identifies mismatches early and seals positioning in the post like a veteran. Per Synergy, about 20% of Hawkinson’s possessions came from the low-post – where he shot 50% and got to the free throw line on a quarter of his possessions. When he doesn’t post, Hawkinson is equally adept at trying to maneuver around his defender with a spin or dribble en route to a high efficiency look at the rim. 36.5% of Hawkinson’s offensive possessions came around the hoop in non-post up situations and he shot 66-for-107 (61.7%) on those opportunities. Essentially, when Washington State tossed the ball inside to Hawkinson, good things happened. Hawkinson is not comfortable dribbling in traffic and, to his credit, he rarely puts the ball on the floor unless it’s absolutely necessary. As a pick-and-roll screener, he generally pops away from the hoop. He shot just 8-for-27 (29.6%) on pick-and-pops whereas he was virtually automatic when finishing his rolls to the basket. But if his rebounding and polished interior skills are helping put Hawkinson on NBA teams’ radars, his defense is clearly holding him back. He was the defensive anchor for one of the worst defensive teams in the country last year. According to KenPom, Washington State’s Adjusted Defense ranked 313th in the country and Hawkinson is partially to blame. Overall, Hawkinson’s rebounding and soft shooting touch will certainly get him some looks from the NBA considering how productive he is in the competitive Pac-12. With Davonté Lacy, Washington State’s leading scorer from last year graduated, the team will rely on Hawkinson to continue his ascent as a dominant offensive big man in the PAC-12. With another summer to work on his conditioning and improve his perimeter touch, it will be interesting to see what kind of jump he can make this upcoming season.